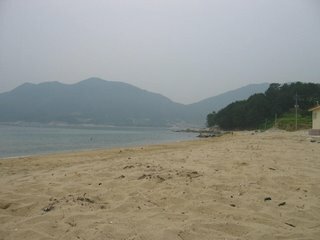 The main beach on Geoje, about a 20 minute drive from Okpo. Gojura Beach. Facilities at the beach are washrooms and showers. There is a town a short walk away for drinks and food. Lots of parking in the off-season. During the official Korean summer it gets very crowded. Other beaches are Wayheon, on the way to Gojura, and Deokpo, in the opposite direction.